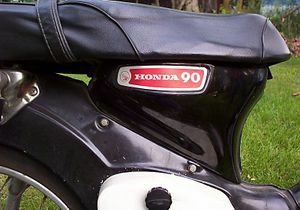 The Honda CM91 was also known as simply the Honda 90. 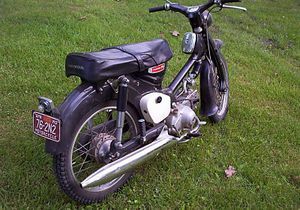 The engine was a 89cc OHC single cylinder; the transmission was a 3-speed with an automatic clutch. 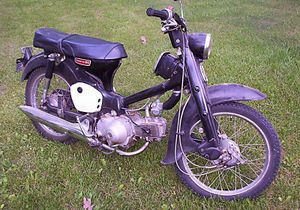 It was introduced in 1966 alongside the similar but 87cc pushrod-engined CM90. In Japan and Europe it was usually grey, but the US models came in three colours: Black, White, and Scarlet Red. all with white legshields. The side covers were also white. 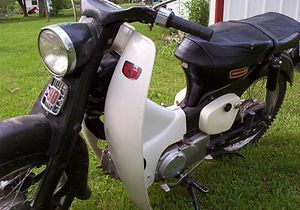 The fuel tank emblem reads "Honda 90" in Europe and the USA, "Cub 90" in Asian markets.. 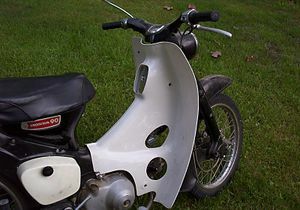 The US model differed from the rest of the world in having a shorter rear mudguard (fender), no direction indicators (Turn signals), and it also lacked the '90' badges found on the side covers in most markets, and the reflectors on the legshields. 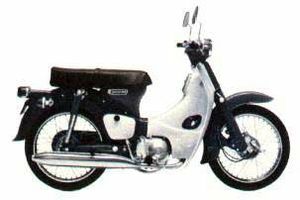 Although in most markets it was replaced by the C90 in 1967, the US model was available until 1970. This page was last edited on 9 February 2011, at 02:03.